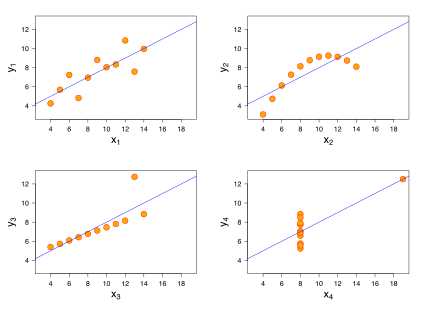 Anscombe's quartet comprises four datasets that have nearly identical simple descriptive statistics, yet have very different distributions and appear very different when graphed. Each dataset consists of eleven (x,y) points. They were constructed in 1973 by the statistician Francis Anscombe to demonstrate both the importance of graphing data before analyzing it and the effect of outliers on statistical properties. He described the article as being intended to counter the impression among statisticians that "numerical calculations are exact, but graphs are rough." The first scatter plot (top left) appears to be a simple linear relationship, corresponding to two variables correlated and following the assumption of normality. The second graph (top right) is not distributed normally; while a relationship between the two variables is obvious, it is not linear, and the Pearson correlation coefficient is not relevant. A more general regression and the corresponding coefficient of determination would be more appropriate. In the third graph (bottom left), the distribution is linear, but should have a different regression line (a robust regression would have been called for). The calculated regression is offset by the one outlier which exerts enough influence to lower the correlation coefficient from 1 to 0.816. Finally, the fourth graph (bottom right) shows an example when one outlier is enough to produce a high correlation coefficient, even though the other data points do not indicate any relationship between the variables. The quartet is still often used to illustrate the importance of looking at a set of data graphically before starting to analyze according to a particular type of relationship, and the inadequacy of basic statistic properties for describing realistic datasets. The datasets are as follows. The x values are the same for the first three datasets. It is not known how Anscombe created his datasets. Since its publication, several methods to generate similar data sets with identical statistics and dissimilar graphics have been developed. ^ a b Anscombe, F. J. (1973). "Graphs in Statistical Analysis". American Statistician. 27 (1): 17–21. doi:10.1080/00031305.1973.10478966. JSTOR 2682899. ^ Elert, Glenn. "Linear Regression". The Physics Hypertextbook. ^ Janert, Philipp K. (2010). Data Analysis with Open Source Tools. O'Reilly Media. pp. 65–66. ISBN 0-596-80235-8. ^ Chatterjee, Samprit; Hadi, Ali S. (2006). Regression Analysis by Example. John Wiley and Sons. p. 91. ISBN 0-471-74696-7. ^ Saville, David J.; Wood, Graham R. (1991). Statistical Methods: The geometric approach. Springer. p. 418. ISBN 0-387-97517-9. ^ Tufte, Edward R. (2001). The Visual Display of Quantitative Information (2nd ed.). Cheshire, CT: Graphics Press. ISBN 0-9613921-4-2. ^ a b Chatterjee, Sangit; Firat, Aykut (2007). "Generating Data with Identical Statistics but Dissimilar Graphics: A follow up to the Anscombe dataset". The American Statistician. 61 (3): 248–254. doi:10.1198/000313007X220057. ^ Matejka, Justin; Fitzmaurice, George (2017). "Same Stats, Different Graphs: Generating Datasets with Varied Appearance and Identical Statistics through Simulated Annealing". Proceedings of the 2017 CHI Conference on Human Factors in Computing Systems: 1290–1294. doi:10.1145/3025453.3025912. Dynamic Applet made in GeoGebra showing the data & statistics and also allowing the points to be dragged (Set 5). Documentation for the datasets in R.